The Dust of 100 Dogs is a novel that merges both present day and historical fiction, spanning the reach of over several centuries. It is told from varying points of view in just about every other chapter. The interesting thing is that the point of view is told from one soul. In the 1700s, Emer Morrissey was living the life of a successful, enterprising, swashbuckling pirate and gathering riches beyond her imaginings. A successful feat, considering her origins. She had a pretty tough childhood. When her parents are killed after Cromwell’s army invades Ireland, her guardianship falls into the hands of an abusive Uncle at the age of six. By her early teens, she manages to escape and eventually leaves Ireland, her voyage ultimately landing her in the Caribbean. But after an enterprising life as a pirate sailing the high seas, manning her own ship, and just after miraculously reuniting with her lost love from Ireland, her life is cut short. Her vindictive murderer dooming her, in her final moments, to live as a dog for 100 lives. In fulfillment of the curse, Emer is reincarnated 100 times over as a dog with her memory intact: thus allowing her a discerning sense of judgment unusual for a canine. Until centuries later, after completion of the 100 lives she’s lived, she is finally born into an Irish-American family as a human girl named Saffron Adams. Due to the extensive knowledge gained throughout the ages, she is considered a ‘genius’ since she knows more than most teens her age. She is brilliant, an excellent student that her parents see as their ticket out of their lower-income status. But Saffron has other plans in mind, and that is to recover the treasure she buried centuries ago when she lived as Emer. She comes from a slightly dysfunctional family, and she is desperate to make something of herself. After high school, she bravely begins her voyage to head where her life as Emer was cut short hundreds of years earlier in an effort to recover this buried treasure. For every other chapter of the Dust of 100 Dogs, A.S. King switches the point of view from Saffron to the pirate Emer, darting you back and forth between the past and present, with intermissions of Dog Facts scattered throughout the novel. But this is not just any dog fact you read, it’s told from the point of Emer/Saffron, when her soul reincarnated into these canines, sharing not only what she learned as a dog, giving handy advice to canine owners, but what she discovered about human nature and ultimately herself. So that when she is reborn again, she’s gained some compassion that was missing in Emer. Emer was a pretty ruthless pirate, and seemed to spare no enemy. The novel is excellent, but some parts are a little graphic. The war in Ireland during Cromwell’s invasion, where women and children are slain. And of course, her life as a pirate with all the battles she waged. 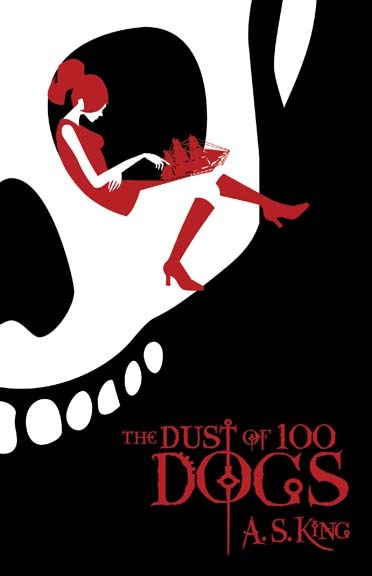 I loved the writing, and enjoyed the dialogue of The Dust of 100 Dogs. I thought A.S. King did a great job on one character named Fred Livingstone who seemed to hear ‘voices’ and carried conversations with himself. That was especially humorous. I could read Fred’s chapter and his quirky self-dialogue over and over again. Although he appears from out of nowhere and seems completely separate from Saffron, he proves to have a very surprising connection with her. The story ends leaving you satisfied for the character.